For a Back to School Social! 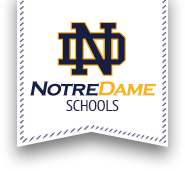 Meet and greet your fellow classmates and welcome all our new Notre Dame families. Catering Provided by Moe’s (Chicken Burrito, Chips/Salsa and Beverages) in the school cafeteria.